Seasonally normal temperatures have finally made at least a brief visit to the great state of Tennessee. With a dark sky that produced precipitation alternating between a fine drizzle and snow flakes, I gave thought to the large fish that sometimes come out to feed under such conditions. Of course, this called for a trip to the Caney Fork for the afternoon so after a large breakfast, I was soon rolling west down I-40. Upon arriving riverside, I saw that feeding fish were periodically working a short stretch upstream aways. I rigged up with hands that were numb before I even started tying on a fly and wondered about my intelligence. The fish were still feeding though so I was soon knee deep in the Caney. After missing several fish I finally had a small rainbow on. However, I struggled to get any more action and finally decided a change of scenery was in order. 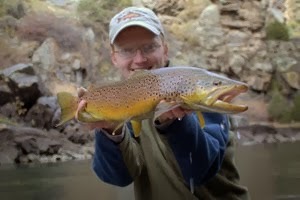 After a short run farther upstream, I started fishing a much more familiar section and soon had another fish on. This turned out to be another standard stocker rainbow (at right). I continued up to where a I had missed a very large rainbow just days before. Working thoroughly, I finally found the fish or its nearest cousin only to actually lose my fly to it this time. Of course, this is completely unacceptable and I want you all to be assured that I will be back soon to find this fish and settle our differences once and for all. I'll also make sure and document said fish with a photograph. After breaking off, I seriously considered calling it a day but decided to fish a bit further downstream. I caught one or two more fish and finally called it a day. Right before I left, a guy from TWRA stopped to check my license. This definitely made my day! It was the first time I've ever been checked on this river so I'm glad to see some enforcement taking place. Anyway, I have a trip to the South Holston in the works so I may be gone for a few days. Check back soon though for pictures and stories from a stream that is new to me! I hope that everyone has a great Christmas and a happy New Years. 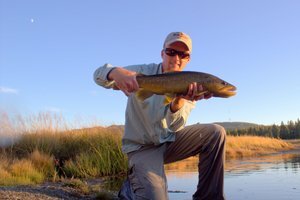 Be sure and take some time to get out on the water to experience some great fishing! I woke up late this morning expecting to just be lazy and tie a few flies. However, when I got online I saw that the water temp in Little River was starting off at a balmy 45 degrees. Despite my late start, I figured that today would be as good a day as any and headed towards the park. I wanted to focus on trying to get a really good fish today so after stopping at Little River Outfitters for a few things, I headed up LR and started hitting some of the big holes. I started catching fish right away but nothing over 10 or 11 inches. After hitting several different holes, I returned to one in particular that I usually do well at. A large black stonefly nymph came out of my fly box and I started chucking it in at the head of the pool. On just the third or fourth cast, I had one of those great strikes where the line just stops and when you set the hook, something heavy is shaking its head. 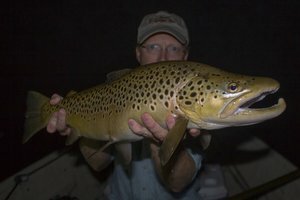 I was really hoping that it was a decent brown but out of the depths came a flash of rainbow. Now I was excited since I haven't got as many nice rainbows this year as in years past. Finally, I had the fish, all 15 inches of rainbow, up for a quick picture (which didn't turn out too good) and slid it back into the pool I had taken it from. Here's the best of the 3 pictures I got of the good rainbow. The fishing today was very good, easily the best I've seen in a couple of months. Fish were feeding heavily just about everywhere I stopped. I even saw a good brown out cruising in one hole. There were good numbers of midges hatching. A Tellico, Zebra Midge, and of course the stonefly nymph all did well today. Most of the fish I saw were feeding subsurface but there were a couple of rises over the course of the afternoon. The Caney Fork had a nice generation schedule on Monday so I went down for the afternoon. Fishing two days in a row is great but your casting arm can get kinda tired, what a rough life... Anyway, I got down to the river and drove around a little while looking over some different spots on the upper river. I finally figured out where I wanted to fish and got down to the water. I was hoping the fish would be feeding heavily but there was only sporadic activity on the surface. Probably the bright sun wasn't helping in that department. Anyway, I tied on my usual dry with a midge dropper and started exploring. The fish were not as easy to find as they are sometimes but I finally got into a few. As the afternoon wore on, the fish became a little more active and I started moving up river towards the area with the best activity. I spotted a very large fish rising upstream and slowly worked into position. By the time I was in the right spot, the fish was not longer rising so I had to guess where I thought he might be. The second cast was apparently right on the money as my dry sucked under and the battle was on. Unfortunately, the fish had somewhere else to be apparently and took off downriver like a freight train. Scared that my 6x would pop at any moment, I felt the sudden surge of the fish towards the surface. Mouth gaping, I stared in awe as my tiny midge popped out of the jaw of a very heavy rainbow and then stood grumbling to myself. Finally I realized that nothing would bring that fish back and I started moving upriver again. Because of the aforementioned sore arm, I worked a bit on casting with my left hand, probably something I should spend a considerable amount of time practicing. A few more average 12 inch footballs were gracious enough to put in an appearance but nothing could top the fish I had momentarily connected with. Late in the day I went up to just below the dam and caught a couple more before heading home. It was an amazing day to be on the water in December with the temperature in the mid to upper 60's so really I can't complain too much although I really wish I could have landed that fish. At least I know where it lives and I'll be back soon and with a net next time. The beautiful weather we've been having called for some fishing so it was off to a river that I've never fished before. 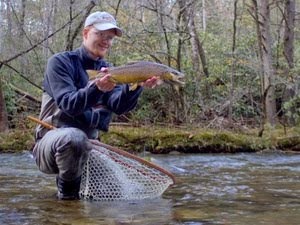 The Clinch is one of the most popular East Tennessee tailwaters and rightly so. Every year, very large fish are caught on this river. Today however, I was just glad to be on the water with the fish biting. I used a dry/dropper setup all day with a parachute Adams dry and various midge droppers. 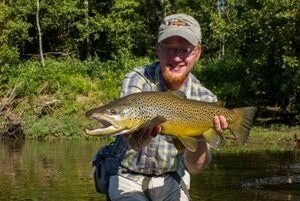 I struggled to find fish of any size for a lot of the day but finally found some nicer fish that were around 12 inches. Not the monsters that I've heard about but they were fat and put on some great aerial displays. It was a good first day on a new river with around 20 fish to hand. As a side note, the late afternoon midge hatches were absolutely huge. The air was swarming with all kinds of small bugs and the fish were greedily feeding on the surface. With the weather supposed to be nice again tomorrow, I'll probably be fishing again somewhere so stay tuned for more.